Fitness System Insider | Get articles, tips and more on our Insider blog! ~ Get articles, tips and more on our Insider blog! – Think about business from a customer centric angle to find insight. – Save money. At least 20%. if you don’t, you’ll be at the mercy of those that did save. – When you first date someone, you’d do anything for them including rubbing their feet and taking out the trash. Don’t lose that if you want a lasting relationship. – Don’t always react immediately. Acting without thinking is usually worse than not acting. – Music makes life fulfilled in every way. It makes your mind vibrate at higher frequencies and attracts love to you. – Carbohydrates make you fat because of insulin. Earn your carbs. Don’t just eat them without training to use them. – Most people believe they desire Liberty, but sell themselves into a slave- like existence for false security or because of a lack of creativity. – You become the story you tell yourself. To change your life, start telling yourself a different story that serves you. What really matters in building a great life? Your individual answer will differ from others, but I believe it’s very useful to reflect on what really matters versus what does not. Not enough thought is given for reflection and meditation about the important matters of life. Moreover, so many of the negative experiences we have in life stem from focussing too much on things that do not truly matter the most in life. I can tell you from personal experience that when I have the most stress, I tend to be focussing on things that don’t truly matter like what others think of me and so on. What follows is a list that I’ve compiled of things I believe are truly important versus things than are not important, but receive too much attention. This list is not complete and will likely never be, but my goal here is to provoke some thought about what really makes a good life, compared to what we think makes a good life. By focussing on what really matters in life, we can avoid unnecessary stress and negative emotions. Staying focussed on what matters will also steer our thinking and actions towards living a great life. How many of the things on the unimportant list are you guilty of thinking about too much? How has it impacted your life? Let me know what you think is important versus what is not by commenting below! I asked the question on social media, “What topic would you like to read about most?” The majority of people asked me to write about business, but there were a good number of respondents who requested I write about living with disabilities. I should note, I’m hesitant to state that I have a disability. There are so many millions around the world who have much more restrictive afflictions than me. I don’t consider my life to be restricted by my disability, however, that does not mean I do not have to cope with incredible discomfort, pain and mobility issues all the time because of auto-immune disease. Auto-immune diseases are very prevalent today. Over 24 million (or 7% of) Americans suffer from an immune system disorder and there are over 80 auto-immune diseases that have been identified, including Lupus, Type 1 Diabetes, and Rheumatoid Arthritis. I live with a form of reactive arthritis called Ankylosing Spondylitis in which my joints, my spine and hips in particular, are plagued with long term inflammation and pain. This disease can lead to fusion of the vertebrae as well as damage to the eyes, bowels and heart in some cases. Most people that live with this condition have terrible back pain, stiffness and fatigue almost every day. The limited mobility of many sufferers of this disease can lead to vascular disease and reduced life expectancy is severe cases. This disease, which I think is fair to call a disability, used to control my life. After my diagnosis, I used to take anti-inflammatories daily in addition to other painkillers. (An interesting side note, I did not do this before I was properly diagnosed. I used to just deal with the pain.) The quality of my life from medication had decreased significantly. I was depressed, I was angry and I felt like a zombie. Moreover, my pain did not lessen. My rheumatologist recommended I take immunosuppressant and chemotherapy drugs, and to never lift weights or work out with any sort of intensity. Based on how I was feeling just from painkillers and over the counter medications, I decided against taking these to further to modulate my immune system. To be frank, part of this decision was based on sitting in a waiting room full of people on these drugs who looked, tired and miserable. I decided I did not want to further alter my immune system and instead I turned my life’s work to exploring how to ease my pain with diet and exercise. Funny story, after the doctor suggested that I not engage in sports or lifting weights I told him that if I was going to be disabled, I at least wanted big muscles so I could push myself around or pull myself up if need be. Fast forward 14 years and I’m now a professional bodybuilder who still plays sports, plays with my kids, and obviously lifts weights. I still have pain and stiffness, but it is nowhere near what it used to be. My mobility is decent (could be better) and I have more than enough energy to get through the daily activities of life and the demands of physical training. I get questions on how I have been able to carry on a normal life without the aid of prescription drugs. I believe there are a few decisions I made that have allowed me to persist which I will share here. I made the decision that I would exercise all the options within my control to ease my symptoms. I believe that we always have choices available to us. In fact, I believe that it’s not what happens to us in life that defines us. Rather, it is how we choose what to do about what happens that defines us. For me, I knew there were a number of choices available to me that I could control including, diet, physical therapy, supplementation and physical exercise. I became obsessed with researching ways to alleviate my symptoms. It’s the body that is responsible for all the healing that takes place. I knew that whatever was wrong with my immune system, at the end of the day I had to give the body what it needed to facilitate healing. This is why I consider myself fortunate. Despite my affliction, I still have the ability to aid my body in healing itself through movement, diet and supplementation. Others with disabilities do not have this option. By remembering this, I remain grateful. By the way, what has worked for me, may not work for you, but I suggest you research all options available to you. There are often more options than we can initially conceive. I decided to never, ever, ever give up. Living with a disability or battling a disease is a scary proposition. When I was diagnosed I decided that my best option was to take action and try to heal myself to the best of my ability. I knew that I was going to deal with this disease for the rest of my life in one way or another. Given that prognosis, I believed this meant I had to fight daily to live the life I wanted, rather than become comfortable in a life I didn’t want. Somedays this battle is harder than others. I still deal with pain, stiffness, fatigue to a certain degree, but this simply means I have to take more action to achieve what I desire. I decided that I could become a better person because of this disease. Having spondylitis has allowed me to learn a great deal about what I am capable of and what type of person I am. Sometimes we don’t really know who we are and what we are capable of until we are faced with incredible adversity. All growth comes from discomfort and perhaps the greatest discomfort in life is being afflicted with a disability. As strange as this sounds, I believe my disease has become an asset for me. It has forced me to examine my life in new ways. It has reminded me daily that I am mortal and I can be hurt. This alone has put much in perspective and inspired me to live better. Spondylitis has helped me to empathize with others in pain. It has also allowed me to meet and even help other that live with similar diseases. Lastly, I changed the direction of my life from entertainment and communication to health and fitness. This led me to become a personal trainer, bodybuilder and eventually open a successful health club chain that helps thousands get stronger daily. This disability is something that I will live with forever, but it does not define who I am. Again, I am usually hesitant to even acknowledge that I have this affliction. Not that I want to live in denial, but I find it a waste of mental energy to even think about it. I have it. I can’t magically make it disappear. All I can do is what is in my control to design my life the way I want. So I focus on what I can control and try to keep my mind off of what I cannot. I think it is worth repeating what has worked for me may not work for you. There is no guarantee my current actions will even work for me in the future. Things change over time and I may have to adapt and evolve my methods for living. I suggest you research and find what works for you and decide to keep on taking action daily to design the life you like. That’s all we can really do! Life is a battle for us all, especially those living with disabilities. Keep on fighting and live and incredible life. Forget About Body Fat Percentage! Also, there is value in knowing what your lean body mass is. If you are eating one gram of protein and carbohydrates per pound of bodyweight, you’re likely taking in too many calories. A better formula would be to eat based on what your lean body mass is (total weight –bodyfat). So, if I weight 180 pounds, but my lean body mass is 165 pounds, I should be taking in nutrients based on 165 pounds. This is especially true is fat loss is your goal. Okay, so you’ve gotten through the first part of this and you’re thinking “Sean, I do train hard and I’m an athlete. Don’t I need to know my BF %? “ My answer to that is no. Let me explain. As a trainer and health club owner, I see too many people become distracted by obtaining a lower BF % and I believe this is the wrong goal. For most cross fit athletes, MMA fighters and other professional sports, the amount of body fat one has is nearly irrelevant. What matters more is performance and the ability to produce on command. For this goal, you need to have a little body fat for the body to tap into for energy. If, on the other hand, an athlete becomes obsessed with some abstraction like BF%, his or her ability to perform will be hindered by an unneeded distraction about knowing a piece of information that will not help them. It should also be noted that body types range widely between person to person. Some folks might walk around at 10% body fat and looked cut and jacked out of their mind simply because they hold fat in different places. I know guys with 15% body fat with incredible abs. The same goes for women. So, if your goal is purely aesthetic, and you train hard and are healthy, the mirror is a much better guide than a BF measurement. Again, some people are genetically predisposed to store more fat in their legs and glutes. Some people store it in their midsection. Where your body fat stores are has at least as much impact on how you look as BF %. Bottom line here, bodybuilders and physique competitors should let the mirror be their guide. Another very important thing to remember about body fat testing is the inconstancy in which results occur. The method of testing- calipers, bioelectrical impedance, hydrostatic tanks- they all produce different results. Most bioelectrical impedance machines, (the ones where you grab the metal parts and hold your arms out) are very unreliable and produce varying results hour to hour. This is especially true if you are well hydrated or have an increased intake in sodium. My wife and I just competed in a bodybuilding and physique show and our coached Jon and Swann DeLaRosa (www.JonDelarosa.com) (www.Swanndelarosa.com) kept our sodium intake high throughout the entire contest prep. About three weeks into the prep, one of my employees at the gym wanted to test Holly’s body fat and the result from the machine was so ridiculous that I made me laugh. It didn’t make her laugh thought. Despite having become significantly leaner, the machine had her at nearly 30 % body fat- overweight / obese. (@fitlilwifey) on Instagram if you want to see how she looked on stage.) (@libertyfreak for my photos). I reassured her not to worry and explained how the reading was off. But, Holly was nearly de-railed by a piece of false information. She should have trusted the mirror and herself. Calipers and hydro tanks are more accurate, however, it’s worth repeating that your BF% may not have any relevance to you depending on what your goals as an athlete are. In closing, if you are an athlete, don’t focus on BF%. It’s a complete distraction to you and will hinder your ability to achieve your goals. If you are NOT an athlete and you know that you have a significant amount of fat to lose, or your gut is solid from too much visceral fat, then you should know your BF% number and work to decrease it via training hard and fueling your body with the proper nutrients based on your lean body mass, not your overall bodyweight. Again, the real takeaway here is that there is no cookie cutter approach or metric that can be applied to the whole population for anything in life. That includes ideal BF%, BMI, sodium intake, or anything else. Know thyself. Don’t be defined or distracted by a number! Do some sort of physical challenge– marathon, obstacle course, Iron Man, fitness competition, bodybuilding or physique show. Test yourself at least once in your life. Who knows? You may fall in love with it. You will surely appreciate your body and what it is capable of. Learn to shoot a gun, bow, or crossbow. Marksmanship is a very useful skill and may come in handy one day. Target shooting is even an Olympic sport. It’s much more difficult than it looks and it may put your outside your comfort zone and force you to grow as a person. Visit a foreign country where your native language is not widely spoken. Learning how to communicate with others from a completely different culture is a very fun and exhilarating experience. It will surely make you grow as a person and expand your understanding and compassion for others. Learn to drive a car. This may seem obvious, but the most recent generation has the least percentage of licensed drivers than the previous ones. With Uber, Lyft and even self-driving cars all around now, don’t let yourself lose out on one of the most important rites of passage an adult can have. Meditate every day for a month. Great leaders, historical contemplatives, and many successful business people all have one thing in common- they have some sort of reflection ritual in which they allow themselves to detach from their thoughts and analyze what they’ve done and where they are going. Call it prayer, reflection, meditation- all of them are practices that force one to calm the mind. Numerous studies show the health benefits from meditation. Practice a martial art. Not only is it physically demanding, marital arts can be an incredible practice for self-confidence, strategy and resilience. Knowing how to defend yourself and others is also very useful. Fall in love. You may have yet to truly fall in love with another. I suggest you allow yourself to experience what it feels like to put another’s needs, desires and hopes before your own. Falling in love is the greatest feeling in the world and though a though a relationship may not work out, the capacity to love is a huge part of what makes us human. Join a social club or gym. Get out of your house and go to a place where like-minded people are doing what you are doing. You will meet new people, make new friends and though cooperation you may even achieve great things…together. Stay a night in a very fancy and expensive hotel. If you have never done this, you will be amazed at the level of attention to every possible detail associated with your experience. From the architecture to the customer service, to the bar, to the bathroom- everything is focused on you. Sometimes, that’s exactly what you need in life. Plus, you may meet exactly the right person you need in your life at that moment. You never know in a nice hotel. Get into a debate. How do you know what you believe is true or if it’s serving your well in life? You will only find out by having to defend those beliefs logically against someone else doing the same. A healthy debate will sharpen your mind and increase your ability to communicate well with others. Take something that changes your mental state. It can be as simple as a glass of wine, a pre-workout drink or an herb…but… WARNING: don’t do something stupid or get addicted to something unhealthy or illegal. However, I believe it is very important to understand that there are different states of consciousness and how you act while experiencing them. Likewise it’s important to educate yourself on substances that alter your mental state and their effects on your body. More information is always better than ignorance. BE SMART! Perform for others on stage. I love the stage. I love delivering entertainment to others. This thought may scare you to death. Good. Get out of your comfort zone and experience what it’s like to perform on stage. You may love it. You may hate it. But hey, at least you did it. Hold a newborn baby. If you want an experience that takes your breath away and allows you to examine the beauty and fragility, hold a newborn baby and look into their eyes. It may be the most beautiful experience in your lifetime. Go to an art gallery. Experience the stories told by humans through their expression of making art. There is so much history, so much beauty, so much emotion. A good art gallery is an incredible adventure. Don’t miss out on it. Learn a choreographed dance. This is really just another way of making art, but the challenge of learning a dance is not only physical and mental, it can also be very emotional. It will give you a healthy respect for professional dancers and performers. Plus, it might be incredibly fun. Write a book, journal or blog. The written word is very powerful. It can be used to pass along stories, entertain and teach others, make something official- it is how many people best express their thoughts. Organizing your thoughts and writing them down makes the invisible visible- and that is something truly amazing. Start a side business or invest in a company. “Wages will make you a living. Profits will make you a fortune.” –Jim Rohn. Experiencing what it’s like to put your capital to use in the marketplace to deliver value to customers in the hope of returning a profit is probably the most stress-filled, anxiety-ridden experience you will ever face. There are so many variables. So many unknowns. So much riding on the line. I’ve heard that its like staring into a dark void and jumping in. But like Space Mountain in Disneyland, it’s the most exciting ride because it’s fast and you can’t see what’s coming. That’s the marketplace- and it’s responsible for nearly everything we have in our lives from food to technology. Give to charity. This is something that I feel has been somewhat overlooked in our society. Charity used to play a big part in communities, but now many look to the State to deliver services to the poor and disabled. They figure they are already being taxed for these services. While that may be true, I would argue there is nothing in life more satisfying that contributing beyond one’s self. Charity is an expression of your capacity to love others. It’s a vital part of our humanity. Handwrite a personal letter and mail it to someone. The handwritten letter, even the physical mail may seem out of style today, but I can assure you, there is something very, very special in receiving a handwritten letter from another. Try it. Though, if you haven’t physically written in a while, maybe work on your penmanship beforehand. Get a philosophy for your life. I believe how your life turns out has more to do with your personal philosophy than what happens externally to you. You may not be able to control external events, but having a strong personal philosophy will allow you to control what those things mean to you. Philosophy can help you understand yourself, others, history and the world around you. It can be used a set of rules for how to live and how to go after and get what you want in life. Think of philosophy as the set of the sail and you are the boat. Want to go further? You have to set a better sail, or refine your philosophy. Personally, I’ve been heavily influenced by the Stoics, Christian, Libertarians, Classic Liberalism, Austrian Economics, Humanism. I would say that from these schools of philosophy, I have developed my own philosophy- my own set of guidelines, rules and lenses for looking at the world and interpreting meaning. I can’t overstate the importance of having a strong philosophy in life. I will however offer a warning- test how useful your philosophy is by reflecting daily on your actions and thoughts. If you can sleep at night knowing that you have done your best to fill your potential and have not trampled the rights or property of others, your philosophy is likely working well for your. If not, it may be time to refine it. I personally have refined my philosophy at least 4 times in my life. I plan on doing it more as I grow as a person. So there it is. 20 Things I believe every one who is capable should do. What’s on your list? Let me know. I’m curious to experience new things and grow! After I graduated high school, I was misdiagnosed with RA, rheumatoid arthritis. I was prescribed Percocet, Darvocet, and a steroid to keep the pain under control. I nearly became addicted to these compounds. To say that I walked around like a stoned zombie would be accurate. Not only that, I stopped lifting weights. After losing lots of muscle tissue and feeling miserable most of the time, I decided to go back and see a specialist. This time, Holly, my girlfriend at the time and now my wife, went with me. The doctor properly diagnosed with with AS, ankylosing spondylitis, a form of reactive arthritis that attacks the joints and organs. People with this specific disease actually carry a genetic marker, HLA-B27. The recommendation of the doctor was that I stop exercising and being immunosuppressive drugs along with chemotherapy drugs to lower my immune system and reduce the pain. After hearing this news, along with seeing how sickly the people in the waiting room were, I decided to completely ignore his advice and embark on a journey of health and wellness. No drugs. Lots of weight training and exercise. I would also try to identify foods that were making me feel bad. I knew that most autoimmune diseases are at least exacerbated by poor diets. This led me to becoming a personal trainer and open my first full-service health club at 24 years old. In 2008 I competed in my first bodybuilding competition. I won my class as a bantamweight and lightweight open. I did two more shows in 2009 and 2010. I won the lightweight class in both of those shows as well. After 2010, Holly and I decided to focus on the business and start a family. I’m happy to say we have been very blessed with two kids and a successful chain of health clubs. This year, 2017 my wife Holly decided that she wanted to push herself to do a figure show. I researched a great deal to find her a coach that I thought would be a good fit and came across Swann DeLaRosa, a top five Figure Olympian. After two weeks of watching Holly’s body transform, I decided that I wanted to test the water again and see if I could make a return to the stage. Swann’s husband, Jonathan has long been my favorite bodybuilder after watching him turn pro at the USAs in 2011. Honestly, I was nervous that he wouldn’t take my on as a client because I wasn’t in contest shape and I only had nine weeks to pull it all together. But on April 1st, 2017 after putting in the work and giving it our all, my wife and I competed together at the Governor’s Cup in Sacramento. She took second in her class in her very first show (and many had her winning the show). She look absolutely amazing and I knew that she had a bright future. I also won the lightweight bodybuilding division and the new classic physique (classic bodybuilding) A class under 170 lbs. Right away my wife called Swann and told her she wanted to do the USAs, just 13 weeks away! Long story short, Holly got sick and was forced to pull out of the show, but I was able to carry on and earn my pro card, becoming a professional athlete. My childhood dream had been fulfilled and the best part was that my kids and coach, (now one of my very best friends) Jon DeLaRosa were present to watch me earn pro status. So how did I do it? A weak, sickly kid with arthritis and asthma? 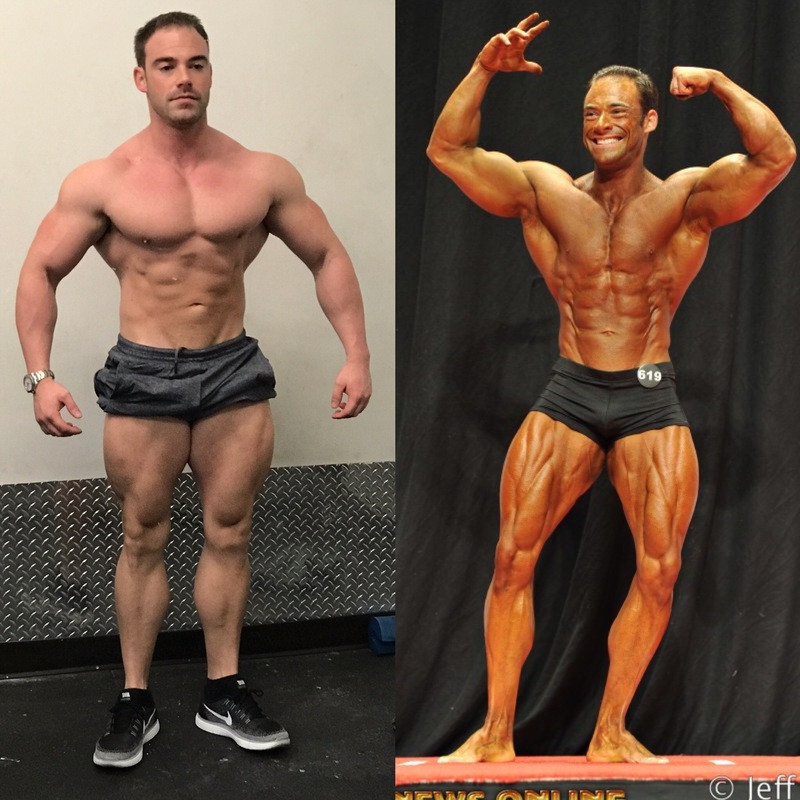 Well, it’s been one week after stepping of the stage of the USAs and I think I know how I was able to make a comeback to the bodybuilding stage and turn pro all within 7 months. I first assembled a great team around me. I had my wife, parents and two amazing, coaches Jon and Swann. As Jim Collins says in the book Good to Great, “First figure out who belongs on the bus. Your team. Then you can figure out where the bus is going.” I didn’t know I’d be turning pro this year, but I assembled the right team to do so first. I trusted the people on my team. When push came to shove and had to cut carbs, change my training style and add more cardio, I didn’t complain. I did the work as prescribed knowing that my team cared about me and had that best plan for me. This is very difficult for most people and frankly, honest, caring coaches who are qualified and hungry to see others do well are very rare. So, I was lucky in a way. I believed in myself. If there is one trait that I have that has made me successful in any way, it is my capacity for faith, or belief, if you will. I have always had faith in myself and those around me, that the best possible outcome will happen. I have never doubted my abilities. I don’t consider myself cocky, but I see obstacles as more of a challenge. Having beat AS and asthma, I love a good challenge. A Napoleon Hill said, everyone has the capacity for faith, but most are using it in reverse gear and getting the things they don’t want in life, the things they fear. I agree. Have faith you can get what you want and then take massive action to get it. I let fate take its course. This may sound counterintuitive considering the previous four steps, but the truth is that some things are outside our control. This is especially true in the bodybuilding world. It’s a subjective sport where opinions matter, not facts. While this may be difficult to handle, the truth is we live in a world where bad things happen to good people, the best don’t always win and terrible things occur. Paying too much attention to things outside our control is a sure-fire way to depression and dissatisfaction. Instead, as the Stoics believed, I spent all the time and effort I could doing the things that were in my control and I let fate take it from there. That doesn’t mean settle by the way. I’m simply saying that we should identify what we have control over and what we don’t and spend all of our energy on the things we CAN control! So there it is, my long journey to becoming an IFBB Professional Classic Physique Bodybuilder. If I’m being honest, it’s still a little unreal. I’d like to thank all my family and friend agains for their support. I’d like to thanks my clubs Fitness System for being the best place to train in California. I’d urge anyone looking to have an incredible coach and human being in their life to look at http://www.jondelarosa.com and http://www.swanndelarosa.com and find out about their services. I’m honored to call them both some of my closest friends. There is a little voice inside your head trying to convince you not to do something you know to be good. “Don’t workout” it says. “Don’t take a cold shower,” the voice shouts. “Don’t bend down to pick that trash up, you’re tired and it’s not even yours,” it murmurs. Does any of this sound familiar? Of course it does. It’s a battle that we all face daily. In fact, it’s really a negotiation. We all negotiate with our mind every single day of our lives. “I really don’t want to go do that, but I really should.” “Well, we could do this, but I’d rather do that because it’s easier and I’m scared.” The voice never ends. It never stops. It’s the voice that keeps you safe, but simultaneously keeps you from reaching your potential. I’m going to offer some advice…don’t negotiate with your mind. If you embark on the journey of negotiating with your mind, you will end up with analysis paralysis and accomplish nothing. Nike’s slogan “Just Do It” (or just don’t do it) is particularly helpful here. If something that needs to be done, or needs to be left alone, I suggest against negotiating with your mind. Instead, trust your instinct. Trust what you know to be true in your heart. Don’t eat that meal. Don’t drink that extra drink. Do that extra rep in the weight room. Bend down and pick up the trash. Play with your family. Visit your relatives. Do you very best. And remember, the path of least resistance makes all rivers and most people crooked. Don’t negotiate with the voice in your head. Take control of it and make it work for you.